Informal supper for all parish residents and friends - simply book in here and join us for a fixed-price, 3-choice meal - or just come for a drink and meet other residents. Over 250 paintings by local artists, plus sculptures, textiles and wood pieces will be available for viewing and purchase. 10:00 - 17:00 - free admission. A percentage of the income will be shared between Rogate church and Canine Partners (assistance dogs for the disabled). The bonfire doesn't build itself! If you enjoy the village bonfire and fireworks, do come along on the previous 4 Saturdays and help build it! 11:00 - 15:00 - free admission. The bonfire doesn't build itself! 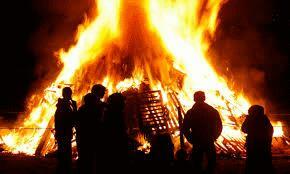 If you enjoy the village bonfire and fireworks, do come along on the previous 3 Saturdays and help build it!